We all spend lots of time helping other businesses achieve their environmental goals, but what about our own? Or if we don’t own our business, what can we do as individuals? The power of one is greater than you might think. I will never forget seeing a preschooler with an empty can in his hand ask an environmentally sleepy host, “Where is your recycling?” The host looked around uncomfortably as this little kid, fully expecting an answer, stared at him. Eventually, the host produced a receptacle. From then on, recycling happened in that house. The difference in impact between requesting something “special,” as in “Do you have x, y or z?” and expecting it to exist, as in, “Where is x, y, or z?” is enormous. Meetings, conferences and events offer exceptional opportunities to educate and modify behavior by being proactive – both by planners and attendees. As a planner, you can start with the actions below. As an attendee you can ask questions to gently encourage planners to meet higher expectations for sustainability. If they are already meeting them, your questions will validate their efforts. Providers will gently wake up to the demand for greater sustainability when they realize attendees and employees expect it. 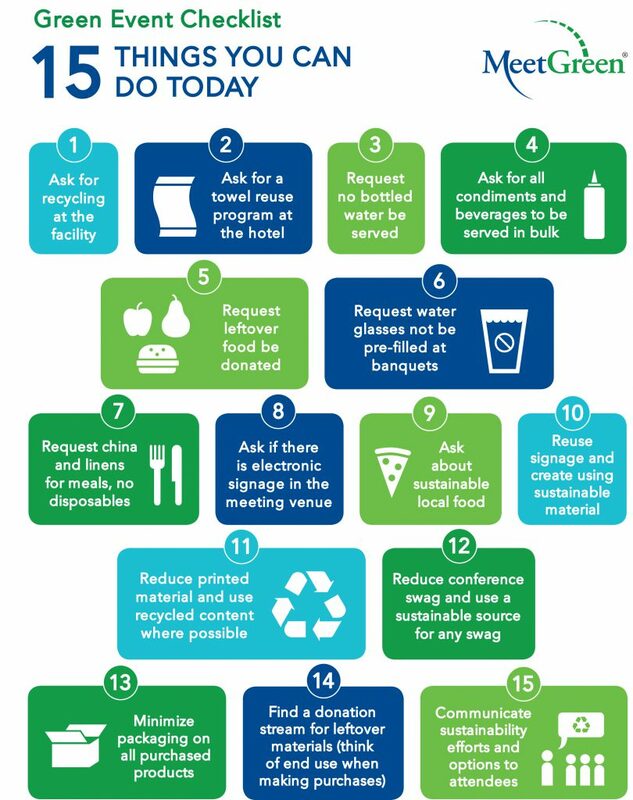 If you are the event coordinator or sponsor, you can get a head start on sustainable planning by visiting the best practices page on The Green Meetings Industry Council (GMIC) website, or any of the resource links at the end of this blog. Technology also plays a role getting you started. The recently updated MeetGreen Calculator tool helps companies audit the environmental impact of conference activities, assess event management practices, and track measurable outcomes in 14 key categories using globally certified, sustainable standards. The calculator is designed for simplicity with options for more advanced use. MeetGreen also created a Carbon calculator, a Sustainable Event Kit, a Sustainable Policy Template and a Green Event Checklist. All are available under the resources tab on the MeetGreen website. Getting buy-in from employees, attendees, vendors, and everyone associated with a company or an event creates a culture of sustainability that resonates out into the communities they serve. Individuals can ask, engage, and acknowledge, and businesses can respond, partner, and deliver. Together we will build a sustainable future that benefits us all. 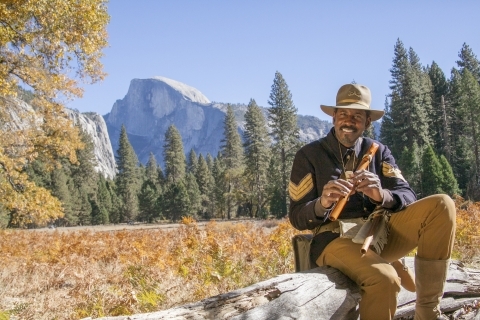 Sign up for the WildNotes Newsletter for more access to environmental news and stories! 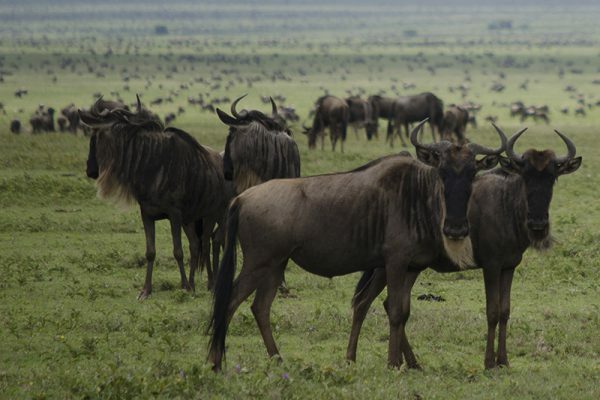 Monitoring Wildlife from Space – We Can Do That! Technology opens up new avenues for research. 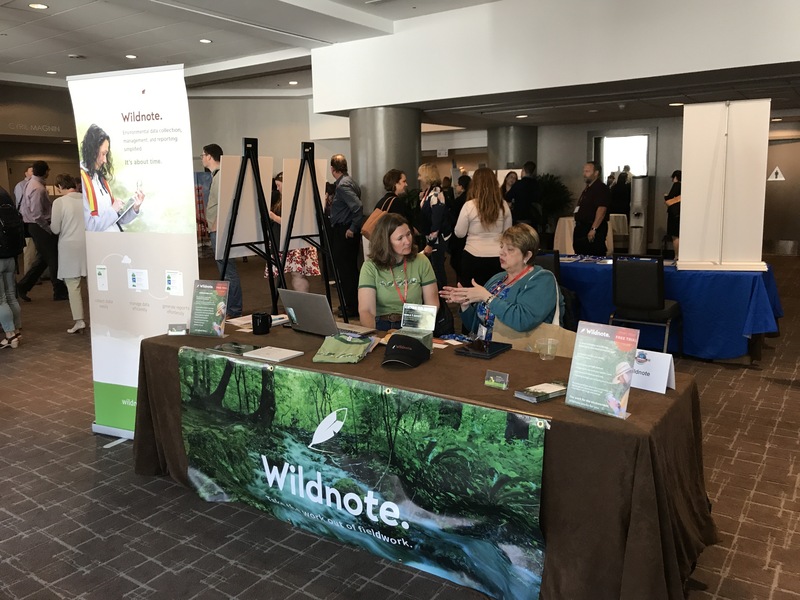 The Wildnote Connections blog highlights good people doing good work in the environmental community. Like a healthy ecosystem, when people and groups connect, the network grows stronger and more productive. Back to Wildnote Home Page. Subscribe to get new blog posts delivered to your inbox!